Today, sees the announcement of the launch of the Converse CONS Project London kicking off this May. Cons Project London will see a programme of music events including a launch party on 29th May with Pusha T, Krept & Konan and Rustie. Converse announces the launch of CONS Project London, the latest installment in a series of global community projects designed to inspire the next generation of creative spirits through music, art, style and skate. Following on from the success of similar initiatives in New York, Los Angeles and more recently Warsaw and Belgrade, CONS Project London will open in Peckham - one of the city's most up-and-coming creative hubs - from Thursday 22nd May. Further details about the CONS Project London when you click "read more" link below. To kick off the project, rapper Pusha T will be launching the CONS Project London where he takes to the stage at the official opening party on Thursday 29th May. Pusha T will see support from London rap duo - Krept & Konan, talented Glaswegian producer Rustie and Rinse FM regular Scratcha DVA. Tickets for this event are FREE, and you can apply via the Cons Project: London website here: http://conversecons.com/ldn - this is an 18+ event! The ambitious 10-week project will help to unleash urban creativity within the community using the space as a hub for a series of talks, workshops and exhibitions; all aimed at inspiring young people, giving them opportunities to learn whilst fueling their creative passions. Five local CONS Ambassadors have curated the project: James Benenson (Urban Nerds), Alex Synamatix (The Daily Street), Scratcha DVA (Rinse/Hyperdub), Jerome Campbell (Converse Cons Skate Ambassador) and Sam Taylor (Vice/Little White Lies). The CONS Project London workshops will offer tangible, hands-on lessons for local youth ranging from age 16 and above, at no cost. The series kicks off with the first of the Inspire | Create seminars which sees The Daily Street Co-Founder, Alex Synamatix, hosting a series of inspirational talks and panel discussions that bring together London’s creative communities to share ideas that inspire, spark collaboration and educate. A Mix Lab series curated by Scratcha DVA is also in the line-up; a music production development program giving burgeoning musicians indispensible access to high profile mentors from the UK’s underground music scene. Each Mix Lab class will allow participants to learn new production skills and gain expert advice on how to shape their own music at the CONS Project London’s in-house recording studio. 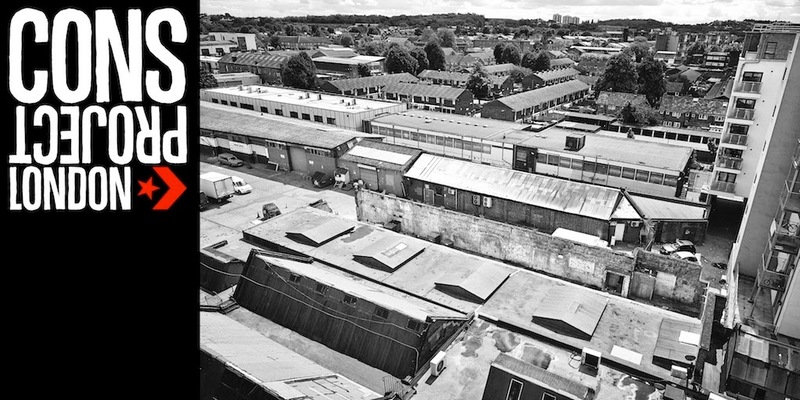 Next up is Journey Through LDN Sounds - a series of raves, screenings, talks and exhibitions at the Peckham space, which celebrate underground music that has symbolised London over the past 30 years. From the early pioneers of Jungle to the current Bass artists pushing the scene forward, Journey Through LDN Sounds will cover the music genres that have defined generations. Converse CONS skate ambassador Jerome Campbell and friends have crafted a calendar of photographic and film inspired skate sessions that will help budding skaters learn new skills within the CONS Project LDN Skate Street - a dedicated outdoor space at the venue which has been built using a host of iconic urban architecture, creating a unique skateable city landscape. The overall aesthetic conjures up an unusual urban street scene, with a collection of random signage, storefronts and its own London pub.